Following the Egyptian uprisings of 2011 and the fall of Hosni Mubarak’s regime, Egyptian civil society witnessed a brief and unprecedented level of openness and freedom to organize. As a result, there was a proliferation in the number of independent women’s initiatives and organizations that opened all over the country. Over the seven years after the uprisings, this openness was restricted. Today’s civil society faces different forms of state repression, and likewise, the response of women’s rights movements and organizations in urban and rural areas has not been uniform. 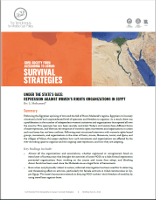 Following semi-structured interviews with women’s rights-based groups, movements, and organizations in the cities of Cairo, Aswan, Mansoura, Assiut, and Qena, and the villages of Minya, this paper explores how such movements and organizations are affected by the ever-shrinking space to organize and the ongoing state repression, and how they are adapting. Almost all the organizations and associations, whether registered or unregistered, faced an extra layer of bureaucracy that brought the activities of some nongovernmental organizations to a halt: formal registration prevented organizations from working on the causes and issues they adopt, and blocking donor funds has been used since the Mubarak era as a legal form of harassment. Even when not physically violent in nature, informal interrogation has been used for its deterring and threatening effect on activists, particularly for female activists in tribal communities in Upper Egypt. The state’s harassment extends to denying NGO workers’ their freedom of mobility by using travel bans against them. More formal repressive measures were taken toward some of the outspoken feminist activists who refused to succumb to pressures and security threats, including freezing of assets and prosecution, under Case No. 173. Some of the well-established organizations are providing a decentralized support to a network of activists in other governorates; however, not everyone agrees that decentralization is a solution. Some groups are weighing risks and benefits associated with institutionalization and how to avoid a need for confrontation with the state, and some have adapted their work to their local communities. The law codified a crackdown on civil society that had commenced much earlier; a number of NGO workers even claim that some of the stipulations of the new law have been applied and used in dealing with CSOs informally. [v] Other laws—particularly the Protest Law (Law No. 108 of 2013)[vi] and the Terrorist Entities and Terrorists Law (Law No. 8 of 2015)[vii]—have also been adopted in policing figures who have been critical of the regime. But Egyptian civil society has been working under an increasingly hostile and repressive environment for the past five years and more intensely since Sisi assumed power. Under Sisi, civil society has witnessed nonviolent repressive measures that have included arrests of political activists, lawyers, political party members, and researchers; travel bans; asset freezes; and ongoing interrogations and trials of civil society workers and staff. This scrutiny was not just for the more radical and challenging NGOs; it also extended to women’s rights groups that are reformist and do not seek to challenge the Egyptian state’s approach to development and human rights. With the closure of public space in Egypt through the issuance of restrictive laws and increased securitization measures, such reformist organizations have also had difficulty conducting their work and even implementing projects that appear to be in line with state policies regarding women’s rights. The research herein provides an overview of the repressive environment in which organizations, groups and initiatives that identify as feminist or focus on women’s and children’s rights are working. Unlike former work published on feminist and women’s organizations and initiatives in Egypt that draws conclusions based on the study of CSOs in urban centers,[ix] the following analysis is aimed at examining the status of women’s organizations both within and outside the center—namely, Cairo—and to shed the light on smaller local initiatives in Upper Egypt and whether they were facing similar restrictions and challenges like their counterparts in other urban centers. [x] The research is based on 14 semi-structured interviews with staff and members of 11 women’s rights and feminist NGOs and initiatives. [xi] Four of the 11 organizations are in Lower Egypt (the governorates of Cairo and Daqhalia) and the other seven are in Upper Egypt (the governorates of Aswan, Qena, Assiut, and Minya). All interviews took place between December 2016 and April 2017. Before the Egyptian state began its co-option of women’s rights organizations and groups in the 1960s during the era of President Gamal Abdel Nasser, Egyptian feminists united with their counterparts in the Arab world and others worldwide who put the “women’s question” at the heart of their fight against colonialism. Under Nasser and his successor Anwar al-Sadat, the state created councils and, later on, state-affiliated organizations to focus on women’s and children’s rights and better integration of women in the public sector; with such procedures, the Egyptian state inaugurated a long tradition of “state feminism.” While the stated mission of these entities was to empower Egyptian women, they never challenged the state’s patriarchal structures and practices to achieve that mission. Some scholars even argue that they exacerbated women’s conditions, particularly under Sadat and Mubarak, by turning “women’s rights” into an elitist interest that is isolated and negatively associated with the first ladies Jihan al-Sadat and Suzanne Mubarak and “western values” they were said to spread. [xii] As a result, and as is the case with many discourses around the world, in Egypt the labels “feminist” and “women’s rights” at times carry negative connotations and are met with distrust by the public. Organizations or initiatives with such labels can invoke public disdain, making their work challenged not only by the state but by society as well. Given this history, and combined with newer forms of organization after the 2011 revolution, the spectrum of women’s rights and feminist organizations in Egypt can be said to span from completely co-opted to somewhat “radical” organizations. [xiii] The former support the government’s programs and adopt its rhetoric and narratives regarding women’s issues. The latter mostly embrace shock tactics and seek to achieve fundamental changes. In between are reformist organizations that endorse the incremental reform approach and/or are willing to work with the government. According to the discussions in the aforementioned governorates, the harassment of women’s rights organizations did not begin with the passage of the NGO Law, but has transpired under different regimes, spanning from informal interrogations and debilitating bureaucracy to travel bans and asset freezes. Almost all the organizations and associations, whether registered or unregistered, faced an extra layer of bureaucracy that brought the activities of some NGOs to a halt. These ranged from stalling formal requests to undocumented or informal refusals to grant security permissions: A registered feminist NGO in Aswan was unable to get permissions to enter schools to start awareness campaigns for girls. [xiv] An unregistered feminist group based at Assiut University was not allowed to enter schools for an awareness campaign it planned, and its one-day workshop on sexual harassment was canceled by the university civilian security one day before its designated date. In Daqhalia, the municipality’s council did not permit an unregistered feminist initiative to hold a street show. These refusals were not formally justified with recourse to the law. Formal registration of NGOs did not facilitate work, but rather prevented organizations from working on the causes and issues they adopt. Over the course of the past four years, the Center for Egyptian Women’s Legal Affairs (CEWLA) in Cairo faced a prolonged process of obtaining permission to implement their projects and campaigns or even for access to venues for their events. For the center, the situation keeps deteriorating. Azza Soliman, CEWLA’s founder, elucidated that the center “faces a challenge entering universities to conduct research there, renting venues for events, or even getting hosted at political parties’ venues. There is no access to those places anymore, because the surrounding community is not welcoming.” Additionally, despite being registered in 2015, a women’s center in Daqhalia governorate was hindered by the Social Affairs Directorate from obtaining legal documents that help in fighting underage marriage. The directorate falsely informed the local court that the center is an unregistered entity. Even when not physically violent in nature, informal interrogation has been used for its deterring and threatening effect on activists, particularly for female activists in tribal communities in Upper Egypt. They receive implicit, and sometimes explicit, threats to expose their political and feminist activism to their families and tribes, a particular concern for women concerned that their family members would not accept their activism. [xv] Hence, some female activists have a compounded risk compared to others in urban centers of Lower Egypt, where political and cultural activism is more common and concentrated around resources and organizations. One example comes from Aswan, where the family of a feminist activist and a former politician was informed of her meetings with activists in 2012 only to be temporarily restricted from those meetings by her family. Another example is from the Delta city of Mahalla, where a female activist kept some of her activism discreet from her family. Despite their overall support for her causes, her family did not want her to compromise her own safety by getting into politics during such repressive times (in reference to the current situation in Egypt). Blocking donor funds is a nonviolent and completely legal form of harassment, and one that has been consistent since the Mubarak era. [xvi] It is omnipresent among organizations that identify as radical as well as reformist organizations. Nazra for Feminist Studies has had all its funds denied by the Ministry of Social Solidarity since 2010, even though the organization is registered under the ministry. Similarly, in 2015, the Daqhalia-based women’s center had a recent blocking of funds by the ministry for one of its projects. A registered organization in Minya was denied funds under the government of the Muslim Brotherhood in 2013 for one of its projects on citizenship for men and women from the villages of Minya; the funding was later approved when the framing of the project was altered. The state’s harassment extends to denying NGO workers’ their freedom of mobility by using travel bans against them. Mozn Hassan of Nazra, a member of the Daqhalia-based women’s center, and Azza Soliman of CEWLA were all banned from traveling in June 2016, March 2016, and November 2016, respectively. Other feminist activists from Aswan, who wish to remain anonymous, were stopped from traveling at the airport in 2016 without even a formal travel ban against them; one has had her passport and laptop confiscated and was interrogated about the reasons for her trip for four hours, while another was condescendingly told by one of the airport officers, “I can’t [afford to] go to Assiut—you want to travel to Lebanon!” Those who were allowed to travel eventually were summoned by Egyptian Homeland Security (also referred to as the National Security Agency) upon their return to Egypt. Finally, more formal repressive measures were taken toward some of the outspoken feminist activists who refused to succumb to pressures and security threats. Both Azza Soliman of CEWLA and Mozn Hassan of Nazra had their assets frozen, in December 2016 and January 2017, respectively, in the context of Case No. 173 of 2011, commonly known as the NGO foreign funding case. Response Tactics: Adaptation and Alternative Structures? Despite the current repressive environment for civil society in Egypt and the harassment NGOs and initiatives did and still do experience, women’s rights groups and organizations are considering alternatives means to function, and even critiquing their own ways of operating and debating the means of circumventing the current crackdown. Some of the well-established organizations are providing decentralized support to a network of activists in other governorates. This is creating new spaces for women and expanding the targeted constituencies to new uncharted territories catering to the needs of women in their local communities. The feminist initiative in Daqhalia was born out of a network that formed during the feminist school organized by New Woman Foundation in late 2014, a Cairo-based feminist NGO; it aims at creating a grassroots women’s movement in the villages and the cities of Daqhalia outside the provincial capital, Mansoura. Picture 1: A poster for one of the street plays organized by an NGO in Deir al-Barsha village in Minya. Groups are weighing risks and benefits associated with institutionalization and how to avoid a need for confrontation with the state. The feminist initiative in Daqhalia is a clear example. It is considering maintaining its noninstitutional structure, without formal registration as an NGO, to have more freedom and to be able to advance feminist causes without antagonizing their local communities, as they are normally suspicious of funds; this sense of suspicion has been fed by ongoing defamation campaigns that Egyptian broadcast and print media participate in. [xviii] The initiative has therefore adopted a nonconfrontational and reformist approach, extending its activities to women, men, and children without creating too much publicity so as to avoid clashing with security, which undermines the initiative’s influence. The group in Aswan is in the process of registration, but is intentionally keeping a low profile to facilitate its work in covering women in marginalized areas. Other organizations chose adaptation as a means of survival. An NGO in Deir al-Barsha village in Minya is adapting the scope of its work to address issues faced by the community, such as female genital mutilation/cutting (FGM/C), domestic violence, hygiene awareness, early marriage, and violence against children. The NGO cooperates with members of the local community through creative means such as street theater. The NGO’s work is sometimes challenged by both the security bodies and its own community, which can be resistant to some of its ideas, yet its activities boost the demand for its work to continue. These recent developments in the context of Egyptian civil society reignite debate regarding the sustainability of CSOs operating under repressive conditions or having their funds cut off, bringing their operations to a halt. While it is healthy to discuss these debates, it is significant to realize the critical situation in which Egyptian civil society is living. While the repressive measures and adaptive strategies referenced herein were under way before the issuance of the NGO Law, the law’s issuance means that the CSOs in Egypt are faced with a real challenge to the continuation of their activities. Both reformist and radical women’s rights groups mentioned in the aforementioned discussion, whether created in the opening of space after 2011 or in the pre-revolutionary period, are grappling with the dire consequences of an escalation and codification of repression. *A glossary of terms referenced in this article and the other articles in the series can be found here. [i] Most scholars of civil society posit that this proliferation in the number of women’s organizations is part of a global trend linked to the process of democratization and the “global schemes of development and good governance” advocated by international agencies such as the United Nations and the World Bank. Scholars of women’s movements in the Global South do not see the particularity of such increase in women’s rights organizations as a surprise because following revolutionary moments, women usually feel more empowered and inspired to challenge the continuing patriarchal practices still intact. In doing so, they organize and form new organizations, movements, and alliances, and as a result for their activism they usually face double challenges. For more on civil society as part of democratization efforts, see Armine Ishkanian, “Democracy Promotion in Civil Society,” in Global Civil Society 2007/8: Communicative Power and Democracy, ed. Martin Albrow, Helmut K. Anheier, Marlies Glasius, Monroe E. Price, and Mary Kaldor (London: SAGE Publications, 2007), 58–85, http://eprints.lse.ac.uk/37038/; see also Christina Ewig, “The Strengths and Limits of the NGO Women’s Movement Model: Shaping Nicaragua’s Democratic Institutions,” Latin American Research Review 34, no. 3 (1999): 75–102; William F. Fisher, “Doing Good? The Politics and Antipolitics of NGO Practices,” Annual Review of Anthropology 26, no. 1 (1997): 439–464; Claire Mercer, “NGOs, civil society and democratization: a critical review of the literature,” Progress in Development Studies 2, no. 1 (2002): 5–22; Niaz Murtaza, “Putting the Lasts First: The Case for Community-Focused and Peer-Managed NGO Accountability Mechanisms,” VOLUNTAS: International Journal of Voluntary and Nonprofit Organizations 23, no. 1 (2012): 109–125; Thomas Parks, “The rise and fall of donor funding for advocacy NGOs: understanding the impact,” Development in Practice 18, no. 2 (2008): 213–222; Kendall Stiles, “International Support for NGOs in Bangladesh: Some Unintended Consequences,” World Development 30, no. 5 (2002): 835–846. On women’s movements in a post-revolutionary context, see Jack A. Goldstone, “Toward a Fourth Generation of Revolutionary Theory,” Annual Review of Political Science 4, no. 1 (2001): 139–187. [ii] A report by Khaled Mansour on the human rights movement in Egypt uses a table for the numbers of CSOs in Egypt from 1925–2016. The table is available at: https://tcf.org/content/report/egypts-human-rights-movement/. [iii] It is worth noting that the methodology of the official numbers cited is not clear because they may include inactive CSOs and NGOs. Also, many NGOs in Egypt are not registered under the Ministry of Social Solidarity and may be legally registered as limited-liability companies or law firms that conduct research and organize events. Hence, these numbers can be understating or overstating the numbers of CSOs that are really active. Finally, though exact figures on which of these were devoted to women’s issues were not made available, ample evidence shows the proliferation of a variety of CSOs, including those working on women’s issues. See the statement by Minister of Social Solidarity Ghada Waly: https://www.youtube.com/watch?v=xhL36QqI-b0. [iv] Examples of statements in which independent political parties, NGOs, and syndicates rejected the new law are available at: https://cihrs.org/مصر-6-احزاب-و22-منظمة-يرفضون-قانون-الجمعي/?lang=en and https://timep.org/press-releases/joint-statement-new-law-will-cripple-egyptian-ngos/. [v] Stipulations include Article 24, which discusses CSO funds and how CSOs are informed of their funds’ approval. Also, Article 72 formalized the roles of the Ministry of Interior and the General Intelligence Agency in the approval of funds for CSOs. Our interviewees mentioned that this approval used to happen informally or covertly. [vi] For an analysis of how the Protest Law was used against political dissent, see Amr Hamzawy’s commentary available at: http://carnegieendowment.org/2016/11/24/egypt-s-anti-protest-law-legalising-authoritarianism-pub-66274. [vii] The Terrorist Entities Law has been criticized heavily for its ambiguity, contradictions, and inconsistencies. In January 2017, an Egyptian criminal court added 1,500 citizens to a terrorist list. Other prominent figures—such as athlete Muhammad Abu Trika and businessman Mostafa Sakr, chairman of Business News, which publishes Daily News Egypt—have had assets seized under the law. See commentary on the verdict by Human Rights Watch, available at https://www.hrw.org/news/2017/01/24/egypt-court-names-1500-terrorist-list and legal commentary in Arabic by the legal department at al-Shorouk, available at http://www.shorouknews.com/news/view.aspx?cdate=23012017&id=2a9c326e-30b3-4a94-bf51-ce9e9e2d9571. [viii] According to Mozn Hassan of Nazra for Feminist Studies. [ix] Although all works referenced demonstrate awareness of the gap between rural and urban spaces and the issue of NGO work being focused on the later, the fieldwork did not explore women’s NGOs outside of Cairo and Giza. See Sunny Daly, “Young Women as Activists in Contemporary Egypt: Anxiety, Leadership, and the Next Generation,” Journal of Middle East Women’s Studies 6, no. 2 (2010): 59–85, https://doi.org/10.2979/MEW.2010.6.2.59; Maha Abdelrahman, Civil Society Exposed: The Politics of NGOs in Egypt (London: I.B. Tauris, 2004); Jad, “The NGOization of the Arab Women’s Movements” (see note 1); and Nadje Al-Ali, Secularism, Gender and the State in the Middle East: The Egyptian Women’s Movement (Cambridge: Cambridge University Press, 2000). [x] There is ample literature about the how NGOs are mostly an urban phenomenon and staffed by urban professionals. For example, Mercer (see note 15) reviews a portion of that literature. Hence, the focus on analyzing the dynamics of NGOs in urban centers makes sense and offers insights about their dynamics in such spaces. Nevertheless, the connection between the urban NGOs and their penetration into rural areas remains understudied. For a unique analysis of microfinances in Minya in Egypt that sheds light on the hierarchy between “the urban and the rural” and how the rural acts as an uncharted market to be penetrated by urban NGOs, see Karim Malak and Sara Salem, “How far does neoliberalism go in Egypt? Gender, citizenship and the making of the ‘rural’ woman,” Review of African Political Economy 44, no. 154 (2017): 541, https://doi.org/10.1080/03056244.2016.1268114. [xi] Because of the burgeoning repression in Egypt, sampling depended on snowball and convenience techniques between December 2016 and April 2017. In Egypt, activists and CSO staff and members face high risks and constant accusation of representing “western and foreign” interests. As a consequence of defamation, smear campaigns and accusations of treason are occasionally launched by the media; hence, interviewing an individual who could possibly contact Egyptian security and falsely report certain CSOs compromises individuals and their organizations’ safety. Before the qualitative coding, interviews were anonymized to preserve the privacy and safety of interviewees, particularly with the targeting of some activists by authorities and the involvement of others in ongoing trials. Interviews were then transcribed, coded, and analyzed for the development of core categories and common themes. It is worth nothing that the findings from the interviews are not geared toward generating generalizations about the situation of feminist and women’s NGOs in Egypt, but rather understanding some of the repression patterns these CSOs and initiatives experience and, most importantly, the strategies they followed in response to such repressive measures. [xii] See Mervat F. Hatem, “Economic and Political Liberation in Egypt and the Demise of State Feminism,” International Journal of Middle East Studies 24, no.2 (1992): 231–251, https://doi.org/10.1017/S0020743800021541. [xiii] This categorization was adopted from Saunders’s classification of the green movement in the United Kingdom. Despite the different political and social context, we believe her typology could provide a useful guide for the Egyptian case. See Clare Saunders, “Double-edged swords? Collective identity and solidarity in the environment movement,” The British Journal of Sociology 59, no. 2 (2008): 227–253. [xiv] The names of some organizations and small initiatives were kept anonymous in the wake of a recent defamation campaign against civil society. [xv] Although tribalism was also referred to in the interviews as a source of security and protection for male members, this was reported more frequently by male interviewees. [xvi] The government has a legal right to fail to approve NGO funding, and thus, transfers of funds from banks to the organization will simply be prevented. [xvii] This debate echoes the general criticism often brought up in the literature on the effectiveness and efficacy of civil society organizations, particularly in the Global South, so it is not only a symptom found in the Egyptian context. See Armine Ishkanian, “Democracy promotion and civil society,” (see note 5). [xviii] There are plenty of examples for these defamation campaigns. One can found here: https://goo.gl/TRkfWU. [xix] This article was written before the closure of Nazra for Feminist Studies on March 16, 2018. Nazra withstood defamation and direct targeting of its staff over the past few years. Its closure confirms the unprecedented and challenging environment for CSOs in Egypt.